Crews have since removed the graffiti, but Chicago police are now trying to figure out who vandalized the Picasso statue in Daley Plaza. CHICAGO (WLS) -- Mayor Rahm Emanuel has proclaimed 2017 to be the "Year of Public Art" in Chicago. Emanuel will designate $1.5 million in the upcoming budget to invest in artists and neighborhood art projects, including the 50x50 Neighborhood Arts Project, the creation of a Public Art Youth Corps, a new Public Art Festival and more. "There is no question that art is vital to a neighborhood's spirit and the quality of life for residents, which is why we have initiated the 50x50 Neighborhood Arts Project," said Mayor Emanuel. "For the first time ever, we'll be allowing Aldermen to dedicate up to $10,000 of their menu funds to finance permanent public art installations in their wards. I've committed to matching those menu funds dollar for dollar, doubling the money and impact of these projects." 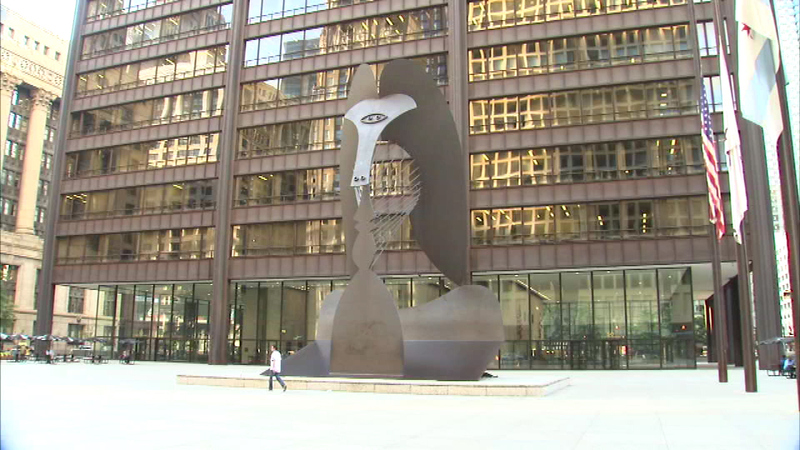 One inspiration for the initiative is the Picasso in Daley Plaza, which marks its 50th anniversary next year. It will also be the 50th anniversary of the Wall of Respect, which once stood at 43rd Street and Langley Avenue. The mayor's office said the "Year of Public Art" will celebrate the history of all of Chicago's iconic art works while investing in local talent and projects to create new works that will bring more art to city neighborhoods. Guidelines for those interested in applying for the the 50x50 project will be made available in January at cityofchicago.org/dcase.